Tacrolimus is a widely used immunosuppressive drug that inhibits the phosphatase calcineurin when bound to the 12 kDa FK506-binding protein (FKBP12). When this binding occurs in T cells, it leads to immunosuppression. Tacrolimus also causes side effects, however, such as hypertension and hyperkalemia. Previously, we reported that tacrolimus stimulates the renal thiazide-sensitive sodium chloride cotransporter (NCC), which is necessary for the development of hypertension. However, it was unclear if tacrolimus-induced hypertension resulted from tacrolimus effects in renal epithelial cells directly or in extrarenal tissues, and whether inhibition of calcineurin was required. To address these questions, we developed a mouse model in which FKBP12 could be deleted along the nephron. FKBP12 disruption alone did not cause phenotypic effects. When treated with tacrolimus, however, BP and the renal abundance of phosphorylated NCC were lower in mice lacking FKBP12 along the nephron than in control mice. Mice lacking FKBP12 along the nephron also maintained a normal relationship between plasma potassium levels and the abundance of phosphorylated NCC with tacrolimus treatment. In cultured cells, tacrolimus inhibited dephosphorylation of NCC. Together, these results suggest that tacrolimus causes hypertension predominantly by inhibiting calcineurin directly in cells expressing NCC, indicating thiazide diuretics may be particularly effective for lowering BP in tacrolimus-treated patients with hypertension. Tacrolimus, a widely prescribed calcineurin inhibitor, is an immunosuppressive drug often used to prevent the rejection of transplanted organs.1 Its use, however, is frequently complicated by side effects, including hypertension, hyperkalemia, and CKD.2 We reported previously that tacrolimus causes hypertension and increases the abundance of the phosphorylated, active, form of the renal sodium chloride cotransporter (NCC) in mice. We showed that NCC activity is essential for the full development of hypertension, and confirmed that tacrolimus increases the abundance of phosphorylated NCC (pNCC) in humans.3 The molecular mechanisms, however, remain largely unknown. To inhibit calcineurin, a serine/threonine phosphatase, tacrolimus must bind to an endogenous protein, the 12 kDa FK506-binding protein (FKBP12).4 When this occurs in T cells, cytokine production is inhibited and it results in immunosuppression. Calcineurin and FKBP12, however, are not expressed exclusively in T cells. Both proteins are widely distributed, so it is possible that calcineurin inhibition in the vasculature, the nervous system, or even T cells themselves, contributes to tacrolimus-induced hypertension. Alternatively, calcineurin inhibition in the distal convoluted tubule (DCT), where NCC is expressed, may activate NCC directly, leading to hypertension. Finally, tacrolimus-induced hypertension may be unrelated to calcineurin inhibition. FKBP12 has many effects that are independent of calcineurin; FKBP12 is a peptidyl prolyl isomerase involved in protein folding, TGF-β signaling, and calcium receptor stabilization.5 Systemic deletion of FKBP12 in mice is embryonic-lethal,6 and disruption of FKBP12 in the vasculature and hematopoietic cells causes hypertension.7 Thus, tacrolimus may disrupt FKBP12 functions that are independent of calcineurin. Here, we tested the hypothesis that tacrolimus activates NCC and causes systemic hypertension by inhibiting calcineurin in the DCT. We generated a mouse model in which FKBP12 can be deleted along the nephron to test this hypothesis in vivo, and corroborated the findings in cultured cells. The results confirm that FKBP12-dependent effects of tacrolimus along the nephron, such as calcineurin inhibition, are largely responsible for its actions on BP. To determine whether tacrolimus could exert direct effects in the DCT, we used nephron-segment quantitative RT-PCR to identify sites along the nephron where FKBP12 and calcineurin are expressed. FKBP12 was expressed by all nephron segments and within glomeruli, as was calcineurin (Figure 1). FKBP12 and calcineurin mRNA are present along the nephron. qRT-PCR of mRNA, extracted from microdissected nephron segments. (A) FKBP12 mRNA is distributed evenly across nephron segments (one-way ANOVA, P<0.05, n=3, ±SEM). (B) Confirming prior results, calcineurin is found in the DCT. Both the calcineurin-α and -β isoform are present along the nephron (n=2). Segmental controls published in reference 25, Primer controls in Supplemental Figure 1. Gom, glomerulus; PT, proximal tubule; TAL, thick ascending limb; DCT, distal convoluted tubule; CT/CD, cortical collecting duct. We next generated mice in which FKBP12 could be deleted along the nephron of adult mice, in response to doxycycline. We bred FKBP12fl/fl mice with mice carrying Pax8-rtTA and TRE-LC1.8 The resulting offspring were screened and selected for FKBP12fl/fl homozygosity and copies of both Pax8-rtTA and TRE-LC1. These mice were born at the expected rate, and appeared normal at birth and throughout development. At 4–7 weeks of age, the mice were given doxycycline (see Concise Methods section). Doxycycline treatment was tolerated well and resulted in FKBP12 gene recombination that was detected in the kidney, but not the heart, brain, or muscle (Figure 2A). Recombination was also detected in the liver, consistent with prior reports using this system.9 RT-PCR of mRNA from mice treated with doxycycline showed that the expected full-length FKBP12 transcript was absent in the kidney. Instead, there was a smaller band, consistent with a transcript missing the excised exon 3 (Figure 2B). Western blotting showed >90% reduction in FKBP12 abundance in the kidneys of KS-FKBP12−/− mice (Figure 2C). A reduction in FKBP12 abundance was also observed in the liver (Figure 2D). Generating KS-FKBP12−/− mice. (A) Semiquantitative PCR of genomic DNA collected from control (–doxycycline) and KS-FKBP12−/− mice (+doxycycline), demonstrating genomic recombination of FKBP12. (B) Semiquantitative PCR products derived from control and KS-FKBP12−/− mouse renal mRNA. A stable FKBP12 transcript is detected in KS-FKBP12−/− mice at the smaller, predicted size for FKBP12 missing floxed exon 3. (C) Western blot of homogenized control and KS-FKBP12−/− kidneys. (D) Quantification of panel C, showing significant reduction in FKBP12 renal protein expression (t test, n=7, ****P<0.001, ±SEM). (E) Western blot of FKBP12 across a panel of tissues showing recombination specificity at the protein level. BP here indicates base pairs. NT indicates nucleotides. Kit indicates the positive control sample. The body weight, plasma creatinine, plasma electrolytes (Table 1), arterial pressure, abundance of pNCC, total NCC (tNCC), and their ratio (Figure 3) were similar in KS-FKBP12−/− mice and controls. Although plasma [Cl−] and anion gap were significantly lower in KS-FKBP12−/− mice (Table 1), these differences were small and of questionable physiologic significance. Further, when electrolyte values were determined 6 months after deletion of FKBP12, the phenotype remained normal relative to controls, including plasma [Cl−] and anion gap (Supplemental Table 1). The kidney structure of KS-FKBP12−/− mice also appeared normal relative to controls (data not shown). Baseline phenotype of KS-FKBP12−/− mice is normal. (A) Control (–doxycycline) and KS-FKBP12−/− mice (+doxycycline) have indistinguishable MAP and diurnal dipping patterns (n=9). (B) Quantification of the MAP shown in panel A. (C) Western blot of homogenized kidneys from a separate group of mice probed for pNCC and tNCC at baseline. (D) Quantification of panel C, levels of pNCC and tNCC are comparable (n=7). For all analyses: t test, P<0.05, ±SEM). MAP, mean arterial pressure. To inhibit calcineurin, tacrolimus must bind to FKBP12. Thus, KS-FKBP12−/− mice are vulnerable to the effects of tacrolimus outside of the kidney, but protected from FKBP12-dependent events along the nephron. Thus, we tested if tacrolimus had different effects in control and KS-FKBP12−/− mice. Tacrolimus treatment caused an initial increase in mean arterial pressure in both groups, but BP continued to rise in the control mice, whereas it remained stable in KS-FKBP12−/− mice (Figure 4). The difference between the slopes of the BP curves was significant (Supplemental Figure 2A). After 14 days of tacrolimus treatment, although mean arterial pressure remained significantly higher in control mice relative to KS-FKBP12−/− mice, BP in both groups began to decline, suggesting some adaptation (data not shown). KS-FKBP12−/− mice are protected from a tacrolimus-mediated increase in BP and maintain diurnal dipping patterns. Average 12-hour mean arterial pressure (MAP) for light and dark cycles in control (–doxycycline +tacrolimus) and KS-FKBP12−/− mice (+doxycycline +tacrolimus) treated with 3 mg/kg of tacrolimus for 18 days (n=6). The slopes of the lines are different (P<0.05). In rodents and humans, BP typically exhibits a diurnal rhythm, with a decline (called ‘dipping’) during the inactive period of the day. Calcineurin inhibitors have been reported to attenuate diurnal BP dipping in humans.10 We found that dipping was initially disrupted by tacrolimus injections in both groups; however, it appeared to recover better in KS-FKBP12−/− mice than in controls (Supplemental Figure 2, B and C). Our previous work illustrated the importance of NCC in tacrolimus-induced hypertension and showed that tacrolimus treatment increased pNCC abundance without affecting tNCC abundance.3 Here, the abundance of pNCC was significantly higher in the kidneys of tacrolimus-treated control mice than in the kidneys of tacrolimus-treated KS-FKBP12−/− mice (Figure 5), suggesting that tacrolimus increases pNCC by inhibiting calcineurin along the nephron. tNCC was slightly lower in tacrolimus-treated control mice than tacrolimus-treated KS-FKBP12−/− mice (Figure 5). Tacrolimus-treated KS-FKBP12−/− mice also tended to excrete more Na+ and K+ than tacrolimus-treated control mice, although these differences did not reach statistical significance (Supplemental Figure 3). pNCC is lower in tacrolimus-treated KS-FKBP12−/− mice than controls. (A) Western blot of kidney lysates from tacrolimus-treated control (–doxycycline +tacrolimus) and KS-FKBP12−/− (+doxycycline +tacrolimus) mice probed for pNCC (T53), tNCC, and the loading control actin. (B) Quantification of pNCC and tNCC normalized to actin as well as the pNCC:tNCC ratio in tacrolimus-treated control and KS-FKBP12−/− animals (t test, *P<0.05; **P<0.01, n=8, ±SEM). Plasma [K+] was not significantly higher in tacrolimus-treated control mice than in tacrolimus-treated KS-FKBP12−/− mice (Figure 6A), although plasma [K+] tended to be higher. As our prior report documented only subtle potassium dysregulation in tacrolimus-treated wild-type mice,3 we explored this issue further. In wild-type mice, pNCC abundance exhibits a strong curvilinear relationship with plasma [K+] under many different conditions.11 This suggests that pNCC abundance is driven strongly by plasma [K+], an effect that impacts downstream K+ excretion and homeostasis. Here, we confirmed this relationship in wild-type mice that were not treated with tacrolimus (reference mice). pNCC values from tacrolimus-treated control mice deviated from values predicted by the line (Figure 6C). In contrast, pNCC values from tacrolimus-treated KS-FKBP12−/− mice fell along the line (Figure 6D). pNCC values were significantly higher in tacrolimus-treated control mice than in tacrolimus-treated KS-FKBP12−/− mice. pNCC values were similar in tacrolimus-treated KS-FKBP12−/− mice and in reference mice (Figure 6E). As activation of NCC tends to reduce potassium excretion, this provides evidence that dysregulated NCC may contribute to the hyperkalemia that can result from tacrolimus administration. 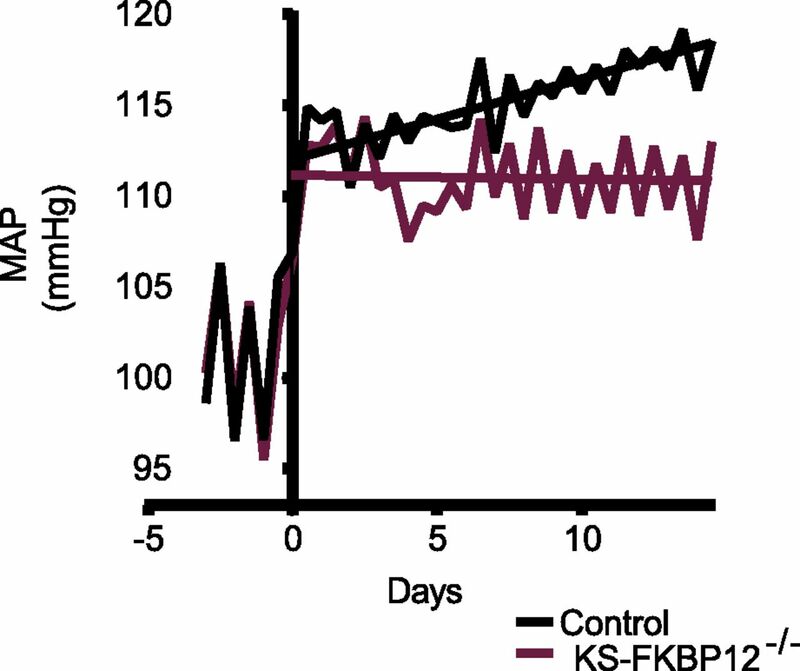 Tacrolimus-treated KS-FKBP12−/− mice maintain their pNCC:plasma [K+] relationship. (A) Plasma [K+] levels are not statistically different between tacrolimus (Tac)-treated control (–doxycycline +Tac) and KS-FKBP12−/− mice (+doxycycline +Tac) (t test, P<0.05, n=14–16, ±SEM). (B) The relationship between pNCC and plasma [K+] levels has been established by others and is shown as a line graph. Reference mice (control mice from separate experiments used to validate this curve) are shown to adhere to this relationship well (C), whereas Tac-treated control mice do not (D). (E) Tac-treated KS-FKBP12−/− mice do maintain this relationship. (E) Quantification of B–D. The absolute difference between the values predicted by the pNCC:plasma [K+] curve and actual values were taken and averaged for each group (n=4–8, t test **P<0.01, ±SEM). As FKBP12 deletion along the nephron alone does not have phenotypic effects, and FKBP12 deletion along the nephron largely prevents tacrolimus effects on BP and pNCC, this suggests that calcineurin is involved in NCC regulation. Although calcineurin is a phosphatase and might be expected to regulate NCC by dephosphorylating it, previous work suggested that tacrolimus might also affect the abundance of NCC-activating kinases. We determined the abundance of two previously implicated kinases, WNK4 and SPAK.3 The abundance of the two kinases was similar in control and KS-FKBP12−/− mice after tacrolimus treatment (Figure 7, A and B). Although SPAK is believed to be the predominant kinase that activates NCC, a homologous kinase, OxSR1 (also called OSR1) is also able to activate NCC and appears to play an especially important role in some circumstances.11,12 The abundance of OxSR1 was lower in KS-FKBP12−/− mice treated with tacrolimus than in control mice treated with tacrolimus. However, a smaller molecular weight band observed using the same antibody was similar in density between the two groups (Figure 7, C and D). Though NKCC2, a NCC homolog, is regulated by OxSR1, neither total NKCC2 nor pNKCC2 was different between tacrolimus-treated control and KS-FKBP12−/− mice (Figure 7, C and D). Abundance of known regulators of NCC. (A) Representative Western blots of tacrolimus-treated control (–doxycycline +tacrolimus) and KS-FKBP12−/− (+doxycycline +tacrolimus) kidney lysate probed for SPAK, WNK4, and actin as a loading control. SPAK, SPAK*, and SPAK++ indicate full length, KS-SPAK and SPAK-2, as described in reference 24. (B) Quantification of panel A. (C) Western blots of tacrolimus-treated control (–doxycycline +tacrolimus) and KS-FKB12–/– (+doxycycline +tacrolimus) kidney lysate probed for OxSR1, pNKCC2, tNKCC2, and actin. OxSR1* denotes a faster migrating form of OxSR1. (D) Quantification of panel C. Quantifications for all panels are normalized to actin: t test, P<0.05, n=4–15, ±SEM. The results described above suggested that tacrolimus inhibits calcineurin along the nephron to activate NCC, but these effects could still be indirect. To provide additional support for a direct mechanism, we tested whether tacrolimus could inhibit NCC dephosphorylation in cells. We developed a dephosphorylation assay system in HEK-293 cells using the K+ channel blocker BaCl2 to depolarize them.13 Before inducing dephosphorylation, NCC phosphorylation was stimulated by transfecting constitutively active SPAK (T243E/S383D). Acute treatment with BaCl2 led to a significant reduction in pNCC, whereas tNCC levels remained unchanged, suggesting dephosphorylation (Figure 8, A and B). Short-term (25 minute) pretreatment with tacrolimus significantly attenuated this response to BaCl2, abrogating NCC dephosphorylation (Figure 8, C and D). Tacrolimus inhibits NCC dephosphorylation in cell culture. (A) Western blot of HEK-293 cells expressing NCC, stimulated with SPAK (T243E/S383D), either treated with vehicle (Veh) or depolarized with BaCl2, and probed for pNCC (T53), tNCC, and actin. (B) Quantification of panel A (quantifications normalized to actin, t test, P<0.05, n=3 wells per experiment, three experiments, ±SEM). (C) Western blot of cells pretreated with vehicle or tacrolimus (Tac) before BaCl2 depolarization. (D) Quantification of panel C (two-way ANOVA, P<0.05, n=3–4 well per experiment, three experiments, ±SEM). Tac, tacrolimus. Tacrolimus is a widely used immunosuppressive drug that inhibits calcineurin when bound to FKBP12. Our previous work showed that tacrolimus increased pNCC, and that NCC is necessary for tacrolimus-induced hypertension to develop. While those results suggested that tacrolimus might be stimulating NCC through direct effects on calcineurin in DCT cells, this remained speculative. Here, we tested the hypothesis that tacrolimus acts directly on kidney tubule cells to cause hypertension, and that inhibition of calcineurin is required for this. To do this, we generated a new mouse model, KS-FKBP12−/−, in which FKBP12 can be deleted along the nephron. The structurally dissimilar calcineurin inhibitors cyclosporine and tacrolimus both cause hypertension, suggesting that calcineurin inhibition contributes importantly to this pathology. Yet, calcineurin-independent effects of tacrolimus may also contribute. FKBP12 is a peptidyl prolyl isomerase involved in many reactions, and its systemic deletion is lethal. Further, Chiasson et al. showed that deleting FKBP12 in endothelial and hematopoietic cells leads to hypertension in vivo.7 We found that FKBP12 is expressed along the nephron, but its role there is unknown. However, our results show that FKBP12 disruption along the nephron does not increase pNCC or cause hypertension; this provides strong evidence that FKBP12 disruption along the nephron is not involved in the hypertensive response. A second possibility is that the effects of tacrolimus in tissues other than the kidney are involved in hypertension and NCC activation. Tacrolimus causes vasoconstriction,14 increases aldosterone,3 and activates the sympathetic nervous system,15 all of which can contribute to hypertension. These systems also ultimately lead to an increase in NCC activity.11,16 As arterial pressure rose during tacrolimus treatment of both control and KS-FKBP12−/− mice, extrarenal effects likely contributed to tacrolimus-induced hypertension as well. Nevertheless, deletion of FKBP12 along the nephron significantly attenuated the hypertensive response to tacrolimus, indicating that the effects caused in kidney cells are essential to the development of hypertension. The current results corroborate results from our previous study showing an essential role for NCC in mediating tacrolimus-induced hypertension. However, the finding in this study that KS-FKBP12−/− mice are not completely protected from the tacrolimus-induced increase in BP does contrast with the complete protection in NCC−/− mice observed previously.3 Both mechanistic and technical factors may account for this difference. In this study, tacrolimus effects on regulatory pathways outside of the kidney, such as the nervous system and the renin/angiotensin/aldosterone axis, may have stimulated NCC despite deletion of FKBP12 from kidney cells. As such upstream effects would be retained in KS-FKBP12−/− mice, BP could still rise through secondary activation of NCC. However, in NCC−/− mice the final common pathway, NCC activation, is absent, and the sympathetic nervous system and aldosterone cannot enhance NCC activity. In our previous study,3 volume pressure recording tail-cuff monitoring, which is less sensitive than radiotelemetry, was used to assess systolic BP. Additionally, the dose of tacrolimus used was lower than that used here. In pilot studies (not shown), we observed both an increase in BP and a statistically significant difference in pNCC using the lower tacrolimus dose in control and KS-FKBP12−/− mice. Yet, in order to ensure that we could detect partial protection in the current experiments, we increased the dose, which magnified both the BP and pNCC phenotype. The higher dose of tacrolimus may also have increased extrarenal effects, contributing to an increase in BP that is both dependent on NCC and independent of it. Nevertheless, the qualitative effects of tacrolimus on both arterial pressure and on pNCC abundance were similar in the two studies. One advantage of telemetric BP monitoring is that pressures can be monitored throughout the day and night. Surprisingly, despite being woken up for daily tacrolimus injections, nocturnal KS-FKBP12−/− mice largely recovered their diurnal BP dipping patterns. Nondipping patterns, which are associated with several adverse outcomes,17 are also correlated with salt-sensitive hypertension, such as that which results from tacrolimus administration.18 Phosphorylation of NCC has recently been shown to oscillate in a diurnal rhythm,19 with lower levels of pNCC preceding the dip in BP associated with the inactive period. This suggests that disruption of diurnal NCC regulation by tacrolimus may contribute to the attenuation in diurnal BP dipping. The abundance of pNCC in tacrolimus-treated control mice was higher than in tacrolimus-treated KS-FKBP12−/− mice. This is in line with our previous work3 and suggests a role for calcineurin in NCC regulation. 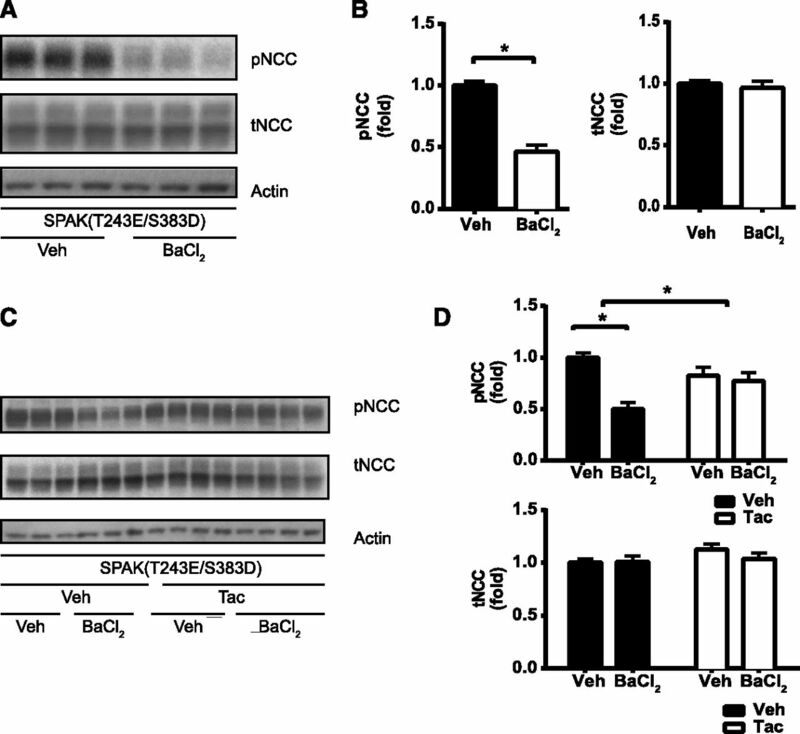 Earlier work described an increase in the abundance of kinases that activate NCC, WNK4, and SPAK,3 as well an electric mobility shift in the latter, when control mice were treated with tacrolimus. An increased abundance of WNK4 was also implicated in an increase in pNCC during administration of the calcineurin inhibitor cyclosporine.20 As calcineurin is involved in regulating transcription factors, such as NFAT, differences in protein abundance are in line with calcineurin activity. While differences between tacrolimus-treated control and KS-FKBP12−/− mice were not observed in this study, both groups in this study were treated with tacrolimus. Only FKBP12-dependent effects along the nephron would result in detectable differences in this study. Thus, WNK4 and SPAK abundance or activation may have changed in response to extrarenal signals or FKBP12/calcineurin-independent events, but we would not be able to detect such differences here. However, this does suggest that if WNK4 and SPAK dysregulation are playing a role in tacrolimus-induced pathologies, they do not account for the full effect, as tacrolimus-treated KS-FKBP12−/− mice did exhibit lower levels of pNCC and an attenuated BP response. Here, we mimicked the depolarization triggered by high plasma [K+] levels with BaCl2, which depolarizes cells and increases pNCC in transfected HEK-293 cells exposed for 24 hours.13 However, instead of overnight treatment, we used a short-term BaCl2 exposure and included constitutively active SPAK (T243E/S383D) to ensure that NCC was fully activated. As tacrolimus inhibited NCC dephosphorylation in this model, it provides support for the hypothesis that calcineurin plays a direct role in NCC dephosphorylation. As these effects were observed in the presence of constitutive activation of the proximate NCC-phosphorylating kinase (SPAK), they strongly suggest that dephosphorylation is involved. These results contrast with those of Glover et al. in which Xenopus oocytes coinjected with NCC and the catalytic subunit of calcineurin showed no difference in 22Na+ transport relative to controls23; however, calcineurin is not active at baseline. Activation by depolarization, a physiologically relevant stimulus, may explain the differences between our studies. Nonetheless, this study does not provide proof of a direct effect of calcineurin to dephosphorylate pNCC, as we utilized transfected HEK-293 cells, which may contain important intermediary proteins. Deletion of FKBP12 did not significantly affect the plasma [K+] during tacrolimus treatment. Even control mice treated with tacrolimus had physiologic plasma [K+] levels. This is in line with our previous findings that mice are relatively resistant to tacrolimus-induced hyperkalemia.3 Yet there was a trend for plasma [K+] to be lower in the KS-FKBP12−/− mice in this study. As the abundance of pNCC has recently been shown to be strongly dependent on plasma [K+] across a wide range of conditions,11 and as this relationship appears crucial for normal K+ homeostasis,13 we tested whether the relationship between pNCC and plasma [K+] was altered by tacrolimus treatment. The results clearly show that NCC is less susceptible to suppression by K+ during tacrolimus treatment, and that this effect is dependent on renal FKBP12. This suggests that, although tacrolimus-treated mice do not become frankly hyperkalemic, a subtle K+ regulatory defect is present. However, power calculations indicate that a very large number of mice would need to be studied to detect a significant difference in K+ excretion. Our data suggest that calcineurin is involved in pNCC dephosphorylation, although as noted, additional work will be required to show that these effects are direct. Tacrolimus, which inhibits calcineurin, would therefore increase pNCC by inhibiting its dephosphorylation, contributing to hypertension and likely hyperkalemia. While the present results confirm an important role of the kidney in tacrolimus-induced hypertension, they also suggest a role for external effects, as the KS-FKBP12−/− mice did experience a rise in arterial pressure during tacrolimus treatment. The results also suggest that the therapeutic and toxic effects of tacrolimus both arise from calcineurin inhibition; thus, to reduce calcineurin inhibitor toxicity, novel agents will need to be targeted directly toward immune cells or specific calcineurin isoforms. Very recent work has found that pNCC abundance is higher in human transplant recipients with hypertension than in controls,25 providing additional support for a role of NCC in patients. Based on this work, thiazide diuretics may prove especially useful in patients who develop tacrolimus-related hypertension. mRNA was extracted from microdissected nephron segments using RNA extraction kit (Invitek Inc.). cDNA was synthesized by reverse transcription (Tetro Reverse transcription, Promega). Quantitative PCR (qRT-PCR) was performed using HOT FIREPol EvaGreen qPCR Mix Plus (Solis BioDyne). Gene expression analysis was performed applying the ∆Ct method and normalized against β-actin. This study was approved by Oregon Health and Science University’s (OHSU) animal care and use committee (protocol IS918) and adhered to the National Institutes of Health Guide for the Care and Use of Laboratory Animals. KS-FKBP12−/− were generated by breeding FKBP12fl/fl mice with Pax8-rtTA/TRE-LC1 mice. Mice homozygous for floxed FKBP12 and possessing at least one copy of Pax8-rtTA and TRE-LC1 were identified by PCR genotyping of tail-clipping DNA. Genetically identical mice were treated with either doxycycline (2 g/l, 50 g sucrose, 1 L water) or vehicle (50 g sucrose, 1 L water) at 4–7 weeks of age for 2 weeks. Male mice from 10- to 20-weeks-old were used for experiments. For details please see the Supplemental Material. Genomic DNA was extracted from snap-frozen tissues using Qiagen DNAeasy kit and amplified by semiquantitative PCR. Tissue was preserved in RNA. Later, mRNA was extracted with Oligotex Direct mRNA Mini Kit. cDNA was transcribed using Finnzymes Phusion Kit and amplified by PCR using exon-spanning primers. Tissue lysates were prepared by dounce homogenizing snap-frozen samples, in chilled lysis buffer as described.24 Samples were spun and separated on 4%–12% Bis-Tris gels (Invitrogen) and immunoblotted with antibodies described in the Supplemental Material. Blots were quantified using ImageJ software (http://rsbweb.nih.gov/ij/). Blood was obtained by cardiac puncture in heparinized tubes. 100 μl was used for analysis by I-STAT (chem 8+ cartridge, Abbott Point of Care). The rest was spun and the plasma used for a colorimetric Mg2+ assay (Pointe Scientific Inc., Xylidyl Blue assay). Mice were given 0.3 mg/kg buprenorphine (analgesic) and 10 mg/kg ciprofloxacin (antibiotic) prior to surgery. Under isoflurane anesthesia, TA11PA-C20 radiotelemetry probes (Data Sciences International) were implanted into the left carotid artery of mice. Data collection began after 6–10 days of recovery for 20 seconds every 10 minutes for the length of experiments. Powdered tacrolimus was dissolved in a 3:1 solution of DMSO:Tween 20–30 mg/ml. This was diluted with PBS to 15 μg/ml, and mice were injected subcutaneously with 3 mg/kg for 18 days. Mice were housed individually in metabolic cages on a standard gel diet (Supplemental Materials). After 18 days of tacrolimus treatment, including 2 days of acclimation, 24-hour urine samples were collected under a layer of water-saturated mineral oil. Urine was analyzed for Na+ and K+ by dual flame photometry using a Li+ internal standard. The absolute difference between predicted pNCC values, using the best fit line for previous data11 y=6.593(-0.5383*x)-0.01761, and actual pNCC values (pNCC densitometry was normalized to untreated control mice on a normal diet run on the same Western blot) were averaged. HEK-293 cells expressing NCC (described in Hoorn et al.3) and transiently transfected with SPAK (T243E/S383D) were treated for 25 minutes with 10 mM BaCl2. Cells were pretreated with 30 μg/ml of tacrolimus for 25 minutes before treating with BaCl2. FKBP12 nephron tubule segment-specific qRT-PCR and deviations from the predicted pNCC;plasma [K+] relationship were analyzed by one-way ANOVA with Tukey post hoc test, BP changes were analyzed by linear regression. t tests were used for all other analyses. For all analyses, P<0.05 was considered to be significant. R.A.L. designed this study, performed the experiments except for nephron segment PCR, collected and analyzed the data, generated the figures, and wrote the manuscript. B.H.M. taught R.A.L. how to perform telemetry surgeries. A.S.T. generated the pNCC:plasma [K+] curve used to analyze data in Figure 6. N.H. and M.B. provided the dissected mouse nephron segments for qRT-PCR. K.B., K.M., and S.B. performed qRT-PCR for FKBP12 and calcineurin in these dissected segments. C.L.Y. and D.H.E. conceived of this study, supervised the work, and edited the manuscript. This work was performed by R.A.L. in partial fulfillment of the requirements for a PhD in Pharmacology and Physiology from Oregon Health and Science University. We thank N. Desmarais for technical assistance and Dr. Susan Hamilton and Dr. Jim McCormick for the mice used to generate the KS-FKBP12−/− line. We also thank Eric Delpire and Sebastian Bachman for the use of their antibodies. This work was supported by the National Institutes of Health (DK095841 to D.H.E. and C.L.Y. and 5T32DK067864-10 to A.S.T.) and the American Heart Association (predoctoral award to R.A.L. 14PRE18330021). D.H.E. was the recipient of a Marie Curie Fellowship of the European Union during these studies (PIIF-GA-2012-329677). This article contains supplemental material online at http://jasn.asnjournals.org/lookup/suppl/doi:10.1681/ASN.2015040466/-/DCSupplemental.